best comment – fini – he says: I chose this comment because they made a specific comment on fashion & Seattle, as well as guessing which Value Village you were at. both of you please send me an email with your addresses, and i’ll get these out to you ! and because i printed all of your names on fortunes i drew out of my fortune jar, everyone gets their own little piece of luck… happy friday ! darrah – believe in your abilities; confidence will lead you on. alix – you will have many friends. sun – you will receive a promotion soon. 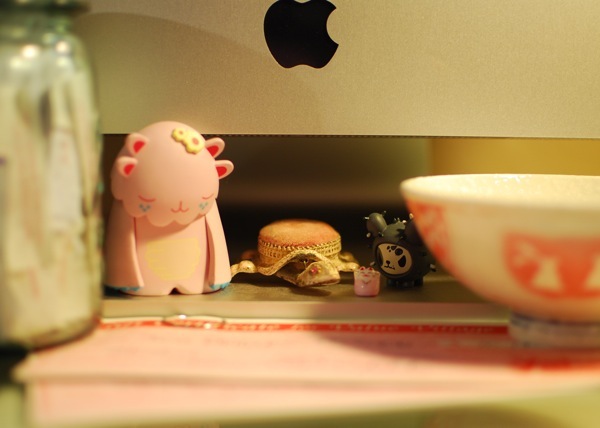 *the picture is of my desk, the fortune jar, bunny bowl holding the names, and the little creatures that live here. What an awesome husband you have! Thanks for the fortune!